It’s hard not to compare books by the same author. I was a little nervous going into Swimming Lessons, because I liked Our Endless Numbered Days so much. I couldn’t help but wonder how she was going to top it. Or at least equal it. Well, she did. The stories are very different, but the compelling nature of her writing is the same. Chapters alternate between Ingrid’s letters about her marriage and the present day narration of Flora and Nan keeping watch by their father’s death bed. This structure allows the slow release of knowledge over time of both Ingrid’s life and the impact of Ingrid’s disappearance on her family. The story of the marriage was the most compelling part of the book, for me. It revealed a hard, painful truth of a marriage based on lies and deceit. It made me angry and full of regret for Ingrid. I felt her deep sense of loss of the life she had hoped to have. I sped along, hoping the letters would eventually reveal to me the mystery of what happened in the end. I thought it was clever the way Ingrid hid her letters in books with titles that suited the content of the letters. I also enjoyed Gil’s “hobby” of buying used books that contained items inside, or interesting marginalia. His books are piled up all over the house – imagine the hours of exploration! Unfortunately, that’s the only thing I like about Gil. Gil, as a person, is an egotistical sleazeball. It’s a wonder Ingrid held out as long as she did. Another interesting topic this book considers is the nature of motherhood. Ingrid struggles in her role as a mother, and I believe she feels her ‘mistakes’ even more acutely knowing that she is not as ‘in tune’ with her children as she believes she should be. Does her crumbling marriage play a part in this? Or the fact that she is often isolated with her children for long stretches at a time? Or maybe motherhood just doesn’t come as naturally to her as it does to others. We can’t know for sure, but it’s inevitable that she will be judged by her actions as a mother… differently than a father would. Flora would have liked to ask her parents why the words ‘to father’ have such a different meaning from the words ‘to mother’. More reviews listed on Claire Fuller’s website. *Thanks to House of Anansi for providing me with a copy of this book for review! Based on how much I loved her last book, I think I’m really going to like this one. Especially with the topics she covers! I think you will, too! Let us know what you think once you’ve read it! Thanks for including my link! So which book of the two would you say you liked better? Your review of Our Endless Numbered Days definitely made me want to read it. Lol well I like books about survival and isolation too and I’ve already read Swimming Lessons 😉 so I’ll just have to check out her first one! You can’t go wrong with either one! If you like one, you’ll most likely like them both. 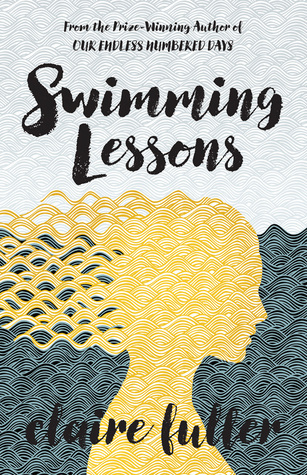 I shared your worries about how Fuller would manage to follow Our Endless Numbered Days, Naomi, but she pulled it off beautifully with Swimming Lessons. ‘Egotistical sleazeball’ nails Gil nicely! So many times I wanted to jump into the book and end her misery with that man! Ugh! He was the worst! Yes, you’re right – it would be a good book for that! And, I think, Gil would be a good character for you to despise, FF! I haven’t read either of Fuller’s books but would really like to. I placed a library hold on this one. I have a special love for books that incorporate letters, whether they’re all-out epistolary novels or not. This sounds like it should be one of our “wives” books, and the theme on motherhood made me think we should read “motherhood” books! Nice review. I still need to read Fuller’s work. I agree, Emily – it would also be fun to read books about motherhood! I wonder how we could incorporate that… alternate themes maybe? I was thinking the same thing recently, Emily! I have been very interested in books on mother-daughter relationships in particular. Motherhood would make a very rich topic. This sounds excellent. I haven’t read her yet but this sounds like I would enjoy her. I think her books have wide appeal! I hope you get a chance to read it! Thanks for commenting! Yay – I’m so glad you loved this one – I’m planning to read it soon and have been nervous for the same reasons you were. And the themes of marriage and motherhood are 100% in my wheelhouse right now. Thanks for the link, Naomi! I’m so glad you liked this book–I think she’s such a good writer. Looking forward to her next book! I keep hearing about this book. I guess I’ll have to put it on my list. Sounds an intriguing premise – I like the idea of all the hidden letters. I also really rated Our Endless Numbered Days so I have great hopes for this – it’s reassuring to hear you think she’s kept her high standard! This book was featured Book Of The Month, a book subscription service in the U.S.! It sounded really interesting. I always get excited when I go to a used bookstore/booksale and find books with notes or things in the pages! haha, Especially when the notes are about the story. I love finding things inside books, too. Even grocery lists and receipts! Sometimes I find these things in library books, as well. Once I found a student’s test, and wondered if I should try to get it back to her. Ohhhh, I had no idea about the premise behind the novel and was a little hmmm about it: now I’m intrigued for sure. Yesterday I was pawing at a copy of Ann Patchett’s memoir, the one with Happy Marriage in the title, and I wish I’d borrowed it after all, as it seems like a great companion for this one! I’ve promised myself I’ll read Our Endless Numbered Days before this one because I already have it on my TBR, but you’re making it a challenge! lol Sounds amazing and a great review. This is one of the new books I’m most excited about! I’m so glad you liked it, and I didn’t know that she had another one before this. Good to know! If you like this one, Cecilia, you’ll have to check out her first one as well! I really did not like Our Endless Numbered Days, so I’ll probably pass on this one. I’m glad it didn’t let you down though! It’s a completely different story, but I guess it depends on what you didn’t like about it. Was it the writing style? It sounds like a rough marriage! Which of Fuller’s books did you like best? The first book has the survival stuff in it (which I know you also like! ), but the second one has marriage and motherhood. It’s a tough call! Oooooh, that last quote, to father vs. to mother, is a really good one. I have never thought of it that way. Also, I hate the way “mothering” is used in a demeaning way, like “quit mothering me,” but you never hear “quit fathering me.” Dammit, patriarchy!